Our Snowmageddon 2017 has been a bust, lol. In Raleigh, North Carolina forecasters thought we’d get at least 4- 6 inches with a possibility of 9 plus. As the storm drew closer they kept reducing our amounts. Feeling anxious like a child, I waited up until midnight. Sadly, it was still rain when I finally succumbed to sleep. I woke up to sleet and finally, the snow began to fall around 7 am. It was beautiful. The whole 2 inches (generously speaking) that fell. It is absolutely hilarious at the hope I still hold on to every time a forecaster predicts snow. What can I say, I grew up in Colorado Springs and Northern Virginia, I miss real snow. I remember in Germany, as a child, the snow would pile up so high. It was magical. I want that magic for my son. Don’t get me wrong, we still went outside and played in our scant snowfall. I think it’s important to play and be silly with my son. He doesn’t know the immensity of a foot plus of snow but he is deliriously happy with what mother nature gifted this go round. I love that about Logan. His joy is pure and attention is all he truly wants. I learn so much from him. I have the day to myself and I keep catching myself watching my husband and Logan. I am so grateful to have a husband who is involved. I forget that sometimes. In a day and time where so much is expected of us, my husband still makes time to play and spend quality time with our son. Logan lights up and loves his father so much. I’m not trying to be sappy, but gratitude is important. I think I get sidetracked with what I’d like and, at times, forget how much I have. My boys ground me and bring so joy much to my life. My New Year’s resolution is to remember how full my life is. To show more gratitude to those I love. Despite the lack of snow on the ground the cold has thoroughly set in. Tonight the low is in the single digits. Similar to last week, it is winter, after all, it is the perfect time for comfort food. Chili is one of my families favorites. 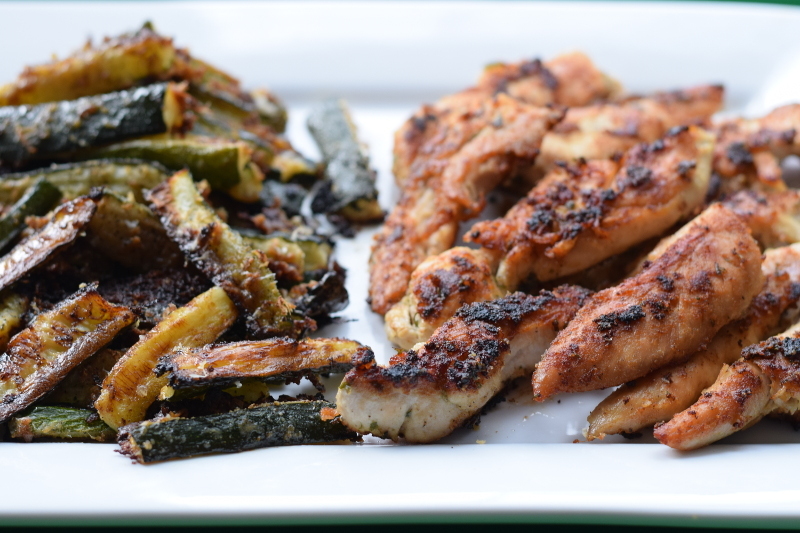 I’ve had to tone down spiciness a bit since having my son, but he LOVES spice so this still has plenty of flavors! This chili has the perfect family balance. 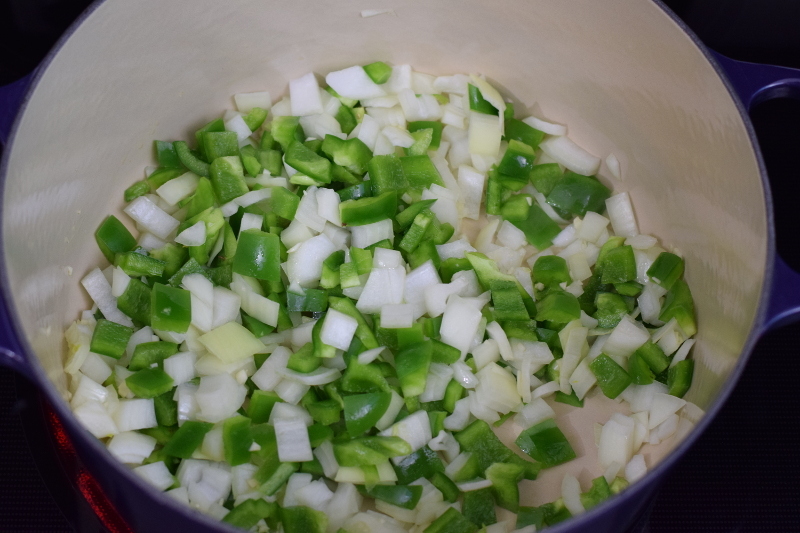 I start my chili with organic grass fed beef, onions, green bell peppers, garlic, salt, and pepper. 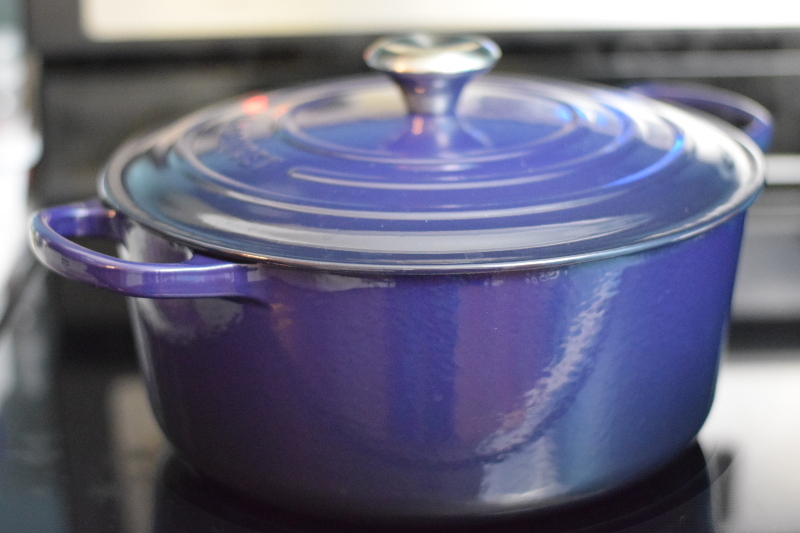 Chili is best made in a dutch oven or large pot. Saute’ beef and veggies until onions are translucent and beef is cooked thoroughly. Be sure to drain excess fat prior to adding any other ingredients. Once you drain the fat, add the tomatoes, spices, beans, and water. It will be watery initially, do not worry. Cover and let cook for an hour on medium low heat (should be at a simmer). Stir and replace lid. Allow to cook 45 min. to 1 hour longer. 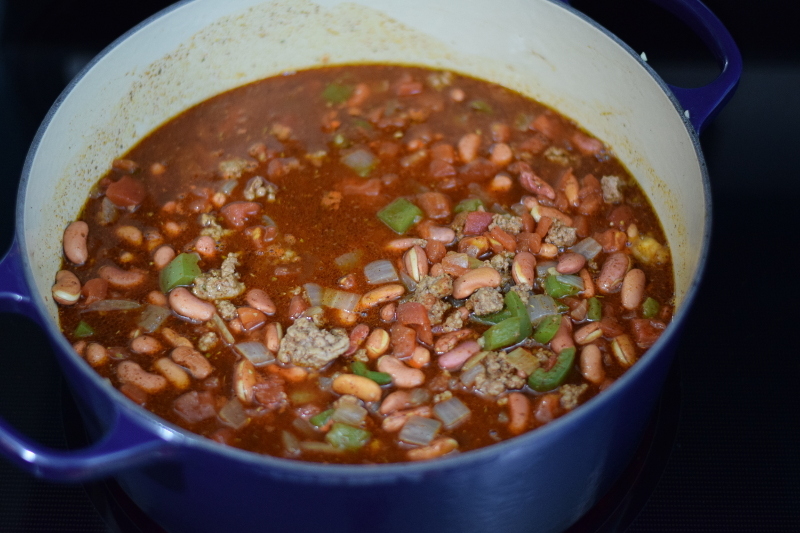 Chili is technically “done” when beans are tender and liquid has cooked down. I personally like to let the chili cook on low for about 2 hours as it lets the flavors really concentrate. Chili is really one of those meals that improve the longer you let them simmer. If you are in a hurry you can eat as soon as the beans are cooked. If using canned beans, your cook time is closer to an hour total. Also, do not add the water if using canned beans. Simmering another 30 min. will help the flavor concentrate. When you are ready to serve find your favorite bowl and dig in! The toppings for chili are endless. Everyone seems to have their own favorite way to enjoy this winter staple. 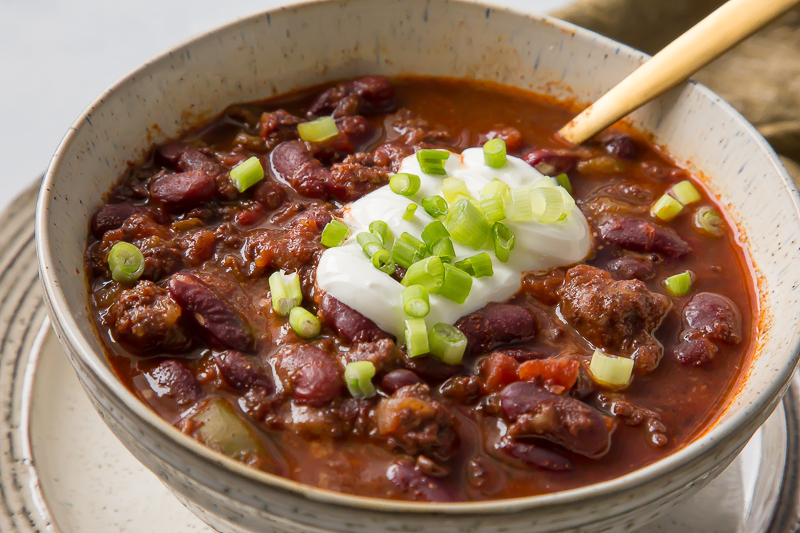 Our favorite toppings for chili are cheese, sour cream, and green onions. What is your favorite way to eat chili? Love these rustic dishes? Me too! You can find them at Pier 1 imports! A family favorite and the perfect comfort food for cooler weather. This chili will warm you right up! Soak dry kidney beans overnight or first thing when you get up in the morning depending on how early in the day you want to eat. Mix all dry ingredients and set aside. Cover and cook on medium-low heat for 1 hour. Occasionally, remove lid and stir. Replace lid. Once beans are tender turn to low cook for 1 more hour, stirring occasionally. Serve and top with your favorites! 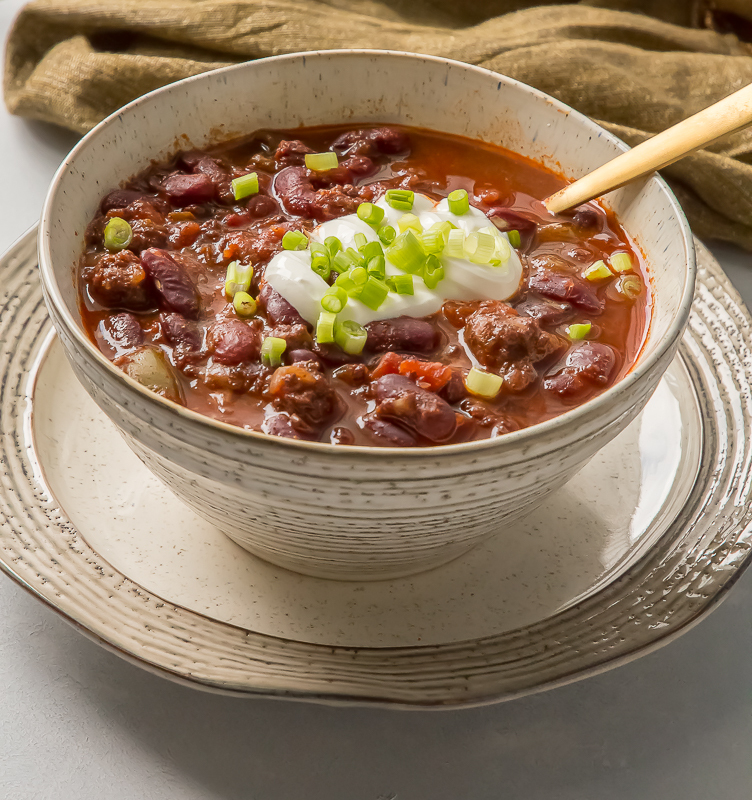 We all love to top our chili with sour cream, cheese, and green onions! 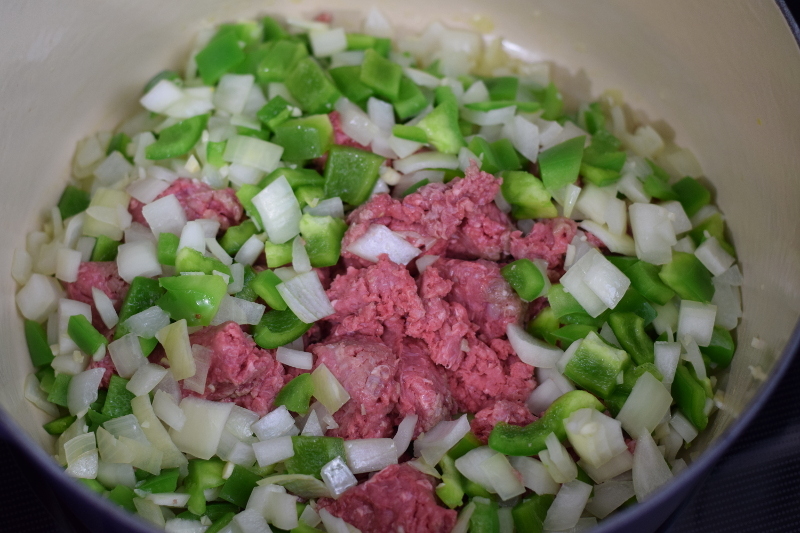 If using canned kidney beans chili will be ready after the first hour. Use 3 to 4 cans in lieu of 1 bag of dried beans. Also, you wont need to add 4 cups of water. When adding canned beans do not drain. When tomatoes are in season using fresh Roma tomatoes makes an awesome upgrade from canned tomatoes. I’m always ready for chili! And your’s looks so very delicious. I would love a bowlful for dinner tonight! Ohh this chilli looks delicious! I love to eat it with avocado on the side and some grain free chips. Yum! Oh yes, the rustic dishes are adorable too. Thanks for sharing!